Handy microfibre screen cleaning cloth cleans glasses, phones, screens. 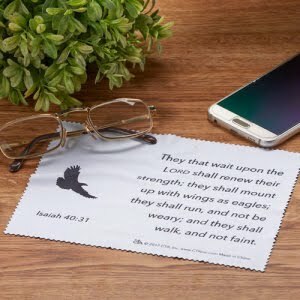 Cloth features a silhouette of an eagle and They that wait upon the LORD shall renew their strength; they shall mount up with wings as eagles; they shall run, and not be weary; and they shall walk, and not faint. Isaiah 40:31. Keep one at the office, home, car, beside table. Anywhere you might need a quick swipe of screens or glasses. Packaged in a thick, reusable vinyl case to keep the cloth fresh.